My little guy is somehow seven years old. 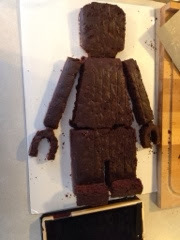 For his birthday, he chose a quiet family party and a chocolate cake in the shape of a Lego mini-figure. I'll be honest - this week has been insane. Hubby and I were out of town until Monday night and we both had conferences until late Thursday night. I hadn't given the cake a second of thought until Friday after work. 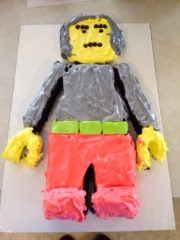 I looked online and found a Lego mini-figure cake pan...clearly I wadn't going to get one of those in time. 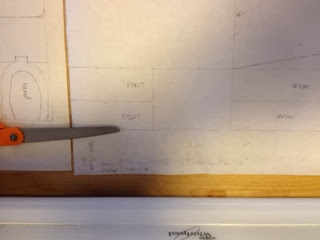 So I asked to see one of his mini-figures, took a ruler, traced my 9x13 and my 8x8 cake pans onto a sheet of white paper, and began scaling to make a template. I was pretty proud of myself for how it came out! When he saw the template sitting on the counter, I got the hugest grin and biggest hug ever, with a sqealed, "Thanks, Mom!!! You're the best!!!" I asked the birthday boy if he'd rather have his favorite marshmallow frosting, which is hard to frost with and wouldn't look as good, or a different frosting that would look better. He easily chose the marshmallow frosting, with support from his sister and dad. I told him he could choose three colors; he picked red, yellow, and gray (even though I said no one would want to eat gray frosting). I over-baked the cake, I think, so it was dry and not all that great. But it looked pretty cool! I've written before about how impossible it is to buy gifts for my stepmom; my dad is equally difficult. This year, he made a special request; although he doesn't like spicy foods, he apparently fell in love with jalepeno jelly at a party some years ago and he asked if I would try making some. I immediately got to work. I didn't have any pectin, so I searched for recipes that didn't require it. I found this one from Simply Recipes. Unfortunately, I only had about a pound and a half of apples (and they weren't green), but I did have the optional cranberries; I hoped that they would compensate for the missing apples. I reduced the water by a cup (again because of the missing apples; I didn't want it to be watery). I used a red pepper (because it was all I had), but otherwise :) followed the recipe exactly. I strained the mash through a fine mesh strainer and got exactly four cups of juice. Then I added the sugar and cooked it down. I didn't want to drag down all of my big canning gear, so I used a smallish saucepan to process the two short jars for my dad. The two taller jars were refrigerated and brought to hubby's and my work parties, along with crackers and cream cheese. I'm not into that sort of thing, but the jelly seemed to be a hit. In my search, I also found this recipe for hot pepper jelly; unlike my dad, hubby loves super hot, spicy foods, so I bookmarked it to try next time for him. 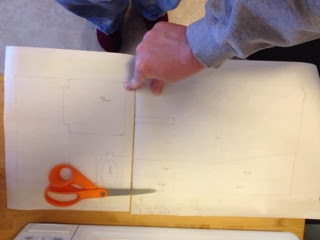 I saw this post on Smitten Kitchen early in December for making pirouettes. We love the pirouettes that come in the brown and white cannister, with their light delicate cookies and yummy chocolate filling. The little girl and I were looking for a cookie to bake a couple of days before Christmas, and I remembered the post. We quickly mixed together the batter (it doesn't take any time at all - just one bowl and a whisk) and then I got to the time-consuming process of baking the cookies three or four at a time. I used a heaping teaspoon and spread the batter into circles. They baked for about four minutes until slightly golden. I used a silicone knife to peel them off the pan and quickly rolled the cookies around a plastic cocktail stick. Once cooled, I melted some chocolate and spread a variety of sprinkles on little plates. The little girl and I had fun dipping the ends of the cookies into chocolate and rolling them in sprinkles. We took them to our annual caroling party where they lasted all of 30 seconds. So yummy! Hope those who celebrate it had a very Merry Christmas...and Happy New Year to everyone! Hubby surprised me with a pasta press this Christmas. Apparently last year during our first unprocessed month, I was bemoaning the fact that, although I'd gotten pretty good at making fresh pasta, I still had to buy elbows for mac-n-cheese and tuna salad and rotini or fusilli for other pasta salads and casseroles. I hadn't really thought about it much - when I made mac-n-cheese, I just used fettuccini...a little unconventional but just as tasty. But apparently after hearing me complain a few times, my wonderful hubby jumped online, ordered me the pasta press for my stand mixer, and it's been sitting in the closet of our guest bedroom ever since. Last night, I mixed up my normal pasta dough (3 eggs and 8.5 ounces of white whole wheat flour) and tried it out. We tested out both the rotini and fusilli plates. The dough was a little too dry, I think,and the fusilli didn't curl, but we figured it out. We served the pasta with some sauce we received from one of hubby's coworkers for Christmas, and along with some leftover broccoli slaw and Christmas ham, it made quite an easy and delicious dinner! A couple of months ago, a friend of mine from work asked me if I ever catered parties. I thought she was just making conversation. "Well, no, except for my brother's rehearsal dinner last year." She asked me if I would be interested in handling the food for a bachelorette party she was throwing for another coworker. I put the date in my calendar, said I would for sure at least help if not cook everything myself, and promptly put it out of my mind until Thanksgiving was over. Suddenly Thanksgiving was over, we were swamped with parent-teacher conferences, dance class, and various pre-holiday social engagements, and it was time for the party! Eek! My hostess friend has absolutely no interest in or knowledge about food/feeding large groups, so she told me that the bride-to-be likes brie, teriyaki wings, and these special chocolate nut goodie bars from a local grocery store. She'd handle picking up the alcohol and nut goodie bars; the rest was up to me. Twenty guests, five o'clock on a Saturday. I decided we needed another dessert (after all, some silly people don't like chocolate! ), which ended up being a good thing because the store only had one small tray of bars. I made mini strawberry swirl cheesecakes, based off of this recipe from Annie's Eats. I replaced the raspberries with strawberries in the puree and baked the cheesecakes in my mini muffin tin in little foil papers. (The minis baked for about 18 minutes.) I was a little disappointed that the cheesecakes sank slightly in the middle after they cooled, but they were still pretty cute and very delicious. Definitely a recipe to make again. For our "main dishes," I used this recipe from Tracey for crockpot teriyaki chicken wings. I upped the wings to four pounds, but was still surprised by how few there were. I would double the recipe for a large party next time. I didn't get a report on how these turned out, but the crockpot came back empty. I also made these turkey-spinach-boursin roll up sandwiches. I first made this recipe for a baby shower, and have made them for several road trips. They are delicious and so easy to eat. Apparently they were a hit and completely disappeared. Because you never want to run out of food, I whipped up an easy cold pasta salad to fill things out: a pound of pasta, eight ounces of fresh mozzarella, a package of halved grape tomatoes, sliced basil, sliced black olives, and a simple vinaigrette. For the brie, I made a golden raisin compote from Cooking Light. I didn't have time to try it, but one of the party guests said it was so good, she could've licked it out of the bowl. :) I made six baguette using Peter Reinhart's pain a l'ancienne recipe from Artisan Breads Everyday - always a winner. Finally (although maybe they should've gone first), I made two dips: my favorite red pepper hummus and a black bean hummus (not an attractive color, by the way!). I served the dips with sliced bell peppers, carrot sticks, and pita chips. And I added some grapes because a meal isn't complete without a little fruit. Hubby drove me to the hotel and was my faithful assistant, helping me set up. Apparently the party was a smashing success; as for us, we went Christmas shopping for the kiddos.